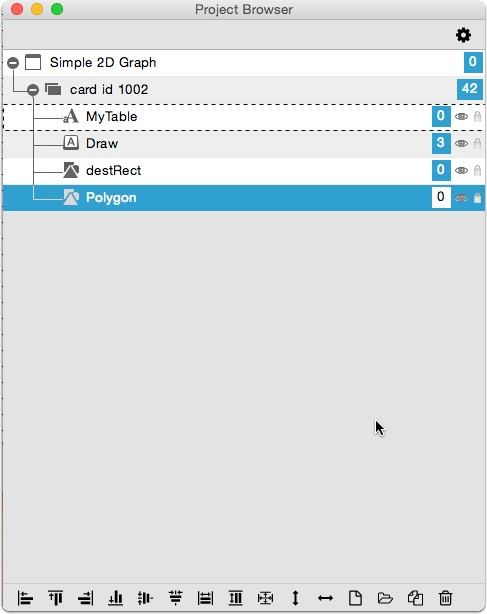 2) Create a button named "Draw". 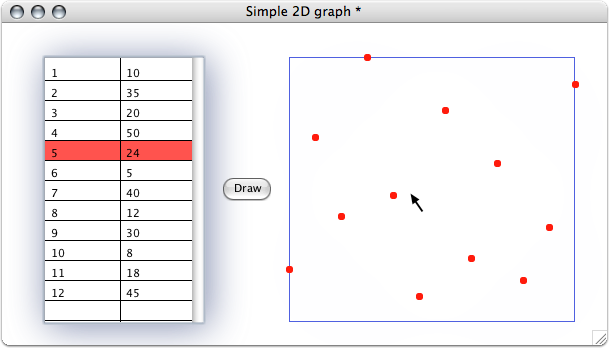 3) Create a rectangle named "destRect", and put it where you want your graph to be drawn. 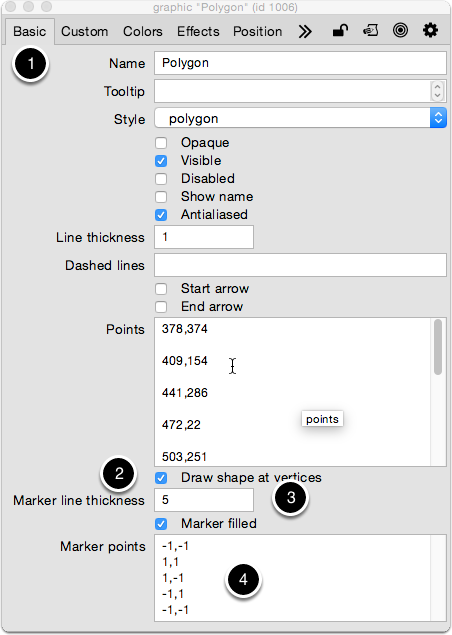 4) Create a polygon and keep its original name "Polygon". You can draw a few points, but don't worry about the size and the position of it. 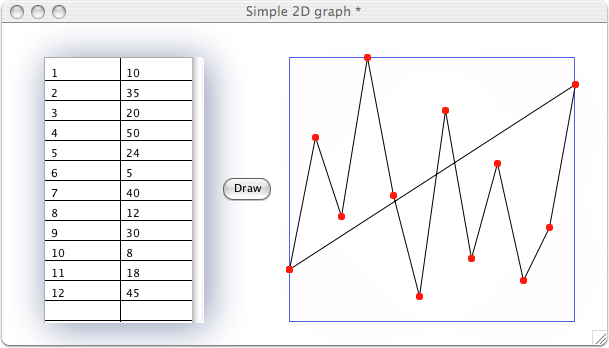 This Polygon will be our graph result afterwards and will be automatically redrawn by our Card Script. If you have questions at this point, you might want to read this lesson first: "How to make a simple line graph". We can see our 4 cards objects with their respectives names, and we have only 2 scripts. One script in our "Draw" button, and our main script in the card. We will explore them now. 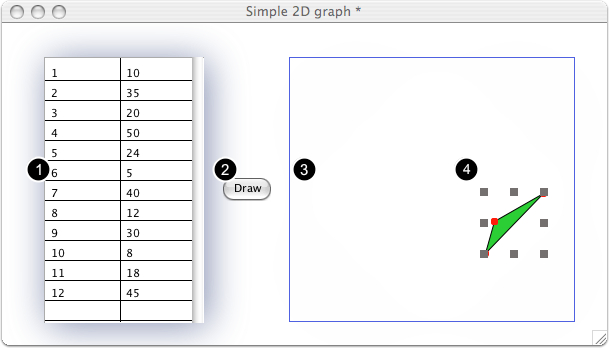 We are calling our card handlerDrawGraph, passing 3 parameters, well, self-explained. 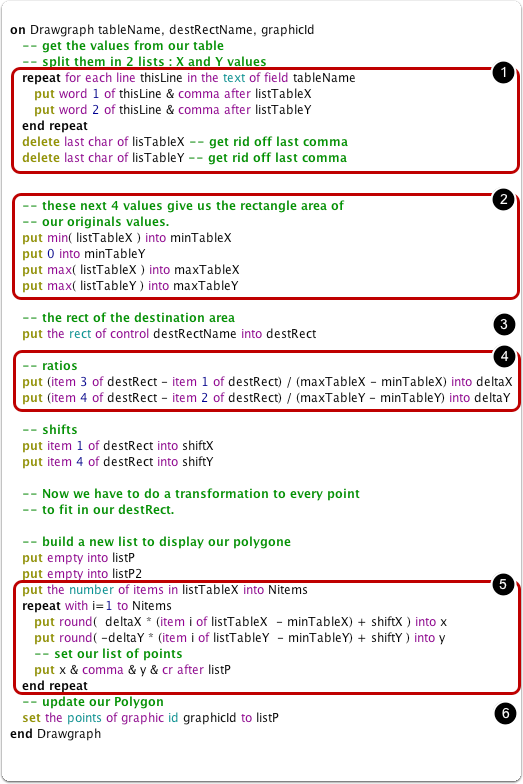 (1) We split our original list of lines of points into 2 lists; one for the X, the second for the Y axis, respectively listTableX and listTableY. (2) We are calculating the rectangle including all our original points. (3) We have the rectangle where all the final points will fit into. (4) We set the ratios for our X and Y values. (6) We update our polygon with our calculated points.... That's it! If you have questions at this point about the details of calculation, you might want to read this lesson first: "How to make a simple line graph". Hmmm, it works, but I don't like these black lines. Above, we see the last lines of our card script, with 2 little changes from the previous script. (1) We add a cr (return) character after each point. Doing so, the polygon sees all our points as split, and it will not draw the lines any more. Easy, no? Now we would like to add some extra information as a line for the X axis, another one for the Y axis, and maybe 4 fields in each corner of our plotter (the blue rectangle) filled with the 4 values we calculated at the beginning of our script. But in this case we are not really using the best of LiveCode. Why not do a minimalist interaction with our plotter? For instance, bringing the cursor close to a red point, will highlight the original corresponding value, which means the corresponding line in our Table. The script displayed above completes our script. See the section "Sleeves up !.." for the first part. (1) We had a list variable listP2. It will contains our list of points. Almost the same as listP, except for the extra cr after each point. (2) We fill our list for each iteration of the repeat loop. (4) We calculate all the distances from our cursor position and each point. It returns the index of the closest point or 0 if the distance is more than minDistance. 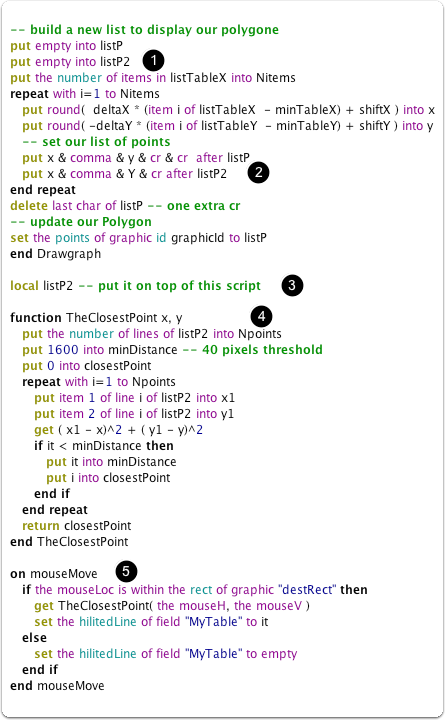 (5) For each move of our cursor, we pass here, call TheClosestPoint() function and highlight the corresponding line. Highlighting a field with empty or 0 will reset the previous highlighted line. Our cursor is positioned around the fifth point, and the fifth line is highlighted. Select our Polygon, open the Property Inspector. (1) Choose the Basic tab. 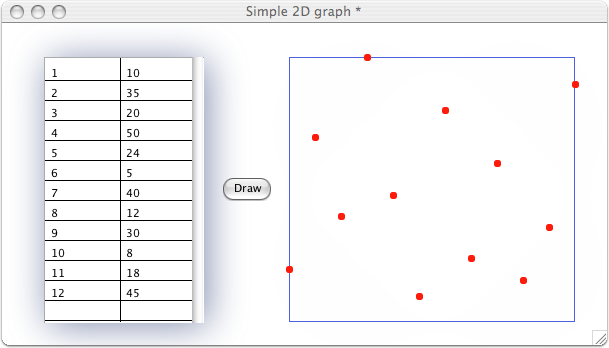 (2) Select the Draw shape at vertices option. (3) Choose the size of the line. For setting the red color, in (1) Select "Colors" and choose the color of the Marker Border Fill. Prev: How do I Create an ANSI Font Menu? why does the programme not compile? it appears to be an exact copy of the code in the help page but this error is poping up more and more often and I cannot find any reference to what it means or how to adjust - why d you have code in the help file that does not work? the reason you are getting this is because you probably have variable checking switched on and you are not declaring the variables. Variable checking is a good thing, as it encourages good development practices. You can switch it off by clicking the script editor and then selecting: "Edit -> Variable Checking." If you want to keep this feature on (recommended), then add: "local listTableX, listTableY" before you use these variables.